Jean Marc Belkadi gives you over 30 great lines using a variety of techniques and melodic ideas. Covers: alternate, sweep, and skip picking; major scale, chromaticism, arpeggios, superimposing triads; legato, wide intervals, alterations; and much more. 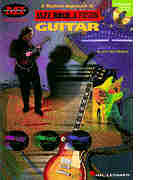 Includes standard notation and tablature.